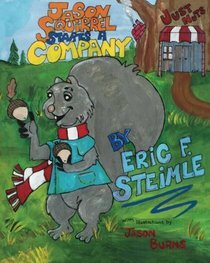 In Jason Squirrel Starts a Company (Amazon), the bushy-tailed protagonist grows tired of fetching heavy bags of nuts each day, and having no leisure time, and thus devises a plan to create a nut-collecting company. After being denied a startup loan from Stan the Banking Turtle, Jason educates himself on the various aspects of running a business (from finance to marketing to staffing), and finds an investor in the form of Grandpa Crow. Overcoming various obstacles, Jason's dream is eventually realised and he expands his woodland business empire by hiring a group of raccoons. Steiml, based the book on his own experiences in starting a business, saying "I thought there should be more books for younger children that talk about building your own company." I really, really hope an eight-year-old illustrated this, because otherwise that is one of the most hideous covers I've ever seen. But maybe the book will inspire young children--in the sense of "Hey! I can do better than THAT!". This sounds sort of like the two British Saucy Squirrel children's books ( 'The Exploits of Mr. Saucy Squirrel' and 'The Further Exploits of Mr. Saucy Squirrel', both by Woodrow Wyatt, published by George Allen & Unwin, 1976 and 1977, illustrated by Gareth Floyd. Saucy Squirrel finds a BIG bag of gold hidden in a tree, and sets out to establish himself as an upper-class gentleman. They were children's books in the 'Paddington Bear' tradition, only instead of instructing five to seven-year children on how to help Mother shop at the supermarket, etc., they presented advice for young children on how to buy a racehorse, how to book a suite at the most exclusive London hotels, how to choose the finest wines, how to hire a contractor to build a mansion, etc. Great straight-faced humor.